The kids are at daycare today and I have a little bit of extra time, so I was going to spend a while cleaning up the house, but that thought made me want to weep with the futility of it all, because the satisfaction of a clean house lasts approximately 90 seconds before it descends into chaos once again, and the satisfaction of a blog post will last at least twice as long as that. The thing is, Zach is incredibly destructive. Not in a way that I think is abnormal for a toddler, but in a way I think I was ill-prepared for, because it turns out — by comparison, at least — that Ellie was an incredibly quiet, tidy baby. Zach is a one-man wrecking crew, and also he is hell-bent on maiming himself in some sort of spectacular way. Child-proofing, it turns out (shocking absolutely no one with more than one child) is way harder the second time around. All of Ellie’s favourite toys have little pieces, or are magnetic, or are made of flimsy cardboard not designed to withstand ravenous chewing by a teething sibling! I’m sure I thrash around at night, mumbling sleepily, “Zach, NO! Stop pulling on the phone cord! Who left the baby gate open? Where did you FIND that? WHAT IS IN YOUR MOUTH?” I’m not prepared yet to say this is a girls vs. boys thing, but. Well. This is a new experience for me. On Wednesday mornings, Ellie has gymnastics, and I think I get more of a workout than the little gymnasts because I spend an hour chasing him around the parent viewing area, which is filled with chairs and purses and plugs and vacuum cleaners and a steep set of stairs he is determined to climb even though he doesn’t really know how, plus a water bottle owned by one of the other parents he is determined to play with even though I would really prefer he not, a preference I make known every week by sighing dramatically every time he approaches it in the hopes that the other mom will stop leaving it temptingly on the floor (the first week I asked her to move it, which she did for a couple of minutes before putting it back on the floor). This has thus far been unsuccessful, although I am optimistic that next week might be better, because this week while tending to an Ellie with a sore foot (I’m not sure how she hurt it — I was too busy chasing him away from the water bottle to see what happened) he managed to crawl over to the water bottle, flip it over, and crawl through the lake it created on the floor TWICE before I got most of it cleaned up. (Water bottle mom: “He sure is QUICK, isn’t he?” Yes, he sure is. Now please move your feet so I can mop around them.) All of the other parents watched this happen, and no one offered to help, which made me feel a little sad about people. I left gymnastics this week all sweaty and frazzled and dishevelled and so worn out I actually ended up falling asleep while the kids napped that afternoon. I think I am going to join one of those calorie-counting websites so I can see if “keeping one-year-old alive at sister’s gymnastics lesson, 60 minutes” is in the list of activities. 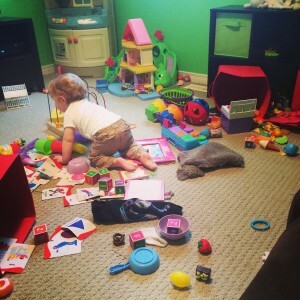 I cannot believe that in a room full of parents, no one offered to help. Seriously, people, IT TAKES A VILLAGE! Tait has far fewer “toy danger” problems due to his lack of older sibling, but I have no idea how he finds some of the things that end up in his mouth. And, boy does he ever get angry when you scoop the unedible item out, like you are taking away his most precious belonging (even if you know he won’t enjoy swallowing that thumb tack …). I don’t know what we would do if Tait wasn’t generally so well-behaved…It boggles the mind! *phew* I don’t think it is a gender thing. D was my quiet, tidy one. G an L are destructive monsters… Adorable, sweet, beautiful MONSTERS.